Not only is this protein 100% vegan and free of artificial flavoring and sweeteners, it is also USDA Organic Certified. 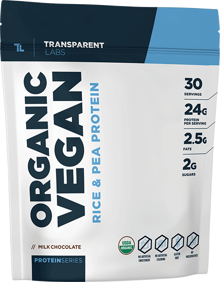 ProteinSeries Organic Vegan has a protein base of 2:1 rice to pea protein ratio. This creates a smooth and reduced grit texture that is not only delicious, but easy on the digestive system. In addition to packing a heavy protein punch (at 24 grams), Organic Vegan also contains a whopping 4 grams of fiber per serving (perhaps one of the most understated components of a plant based protein). Vegan protein is not just for people adhering to a vegan diet, but is a powerful source of protein and fiber for anyone who is focused on total health optimization. Q: What does “USDA Organic” actually mean? A: USDA Organic is a certification process conducted by the United States Department of Agriculture. It requires companies and products to meat the strictest levels of purity and transparency. Read more about it here. Q: How many scoops should I be taking a day? A: We recommend taking 1-3 scoops a day, depending on your specific protein needs/goals. If you are unsure about how much protein you need, we recommend 1g per pound of body weight. Read more about "How Much Protein You Should be Consuming" here. Q: How should ProteinSeries Organic Vegan be taken to maximize its effectiveness? A: Yes! Typically, recovery supplements contain high amounts of amino acids, like Glutamine, but aren’t nearly as high in protein as our ProteinSeries Organic Vegan (24 grams of protein per scoop). Q: I don't live in the United States; can I still buy ProteinSeries Organic Vegan? Q: Can I mix ProteinSeries Organic Vegan with milk (almond milk)? A: Yes, ProteinSeries Organic Vegan can be mixed with milk, almond milk, water, and even your morning coffee. Using milk provides a thicker, creamier taste while water is thinner and more versatile. Q: Can I mix StrengthSeries Creatine HMB with ProteinSeries Organic Vegan? Q: Is ProteinSeries Organic Vegan a meal replacement? A: ProteinSeries Organic Vegan is used to increase your daily protein intake, but isn’t to be used primarily as a meal replacement or weight gainer. Supplementing ProteinSeries alongside nutritionally focused meals is recommended for best results.